WINDYAK is, among other things, the result of a continuous thinking shared for 3 years now between two people having complementary skills and a common nautical culture : a same double practice of sailing and paddling. Convinced by its proper interest, they now want to have it shared by many people. R&D engineer in space industry at Toulouse, Frederic is also educated in yacht design and composite material. 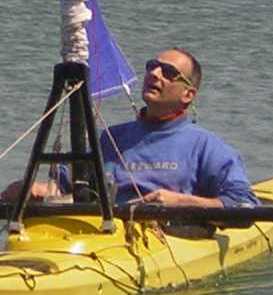 WINDYAK is for himself the logical outcome of 30 years of various sailings and, among them, a very windy Mediterranean sea crossing performed paddling between Nice and Calvi (Corsica) in 2000! Philippe BUSSIERE 43 ans, rig and boat perfecting. Sailmaker (Delta voiles network) and dealer of nautical fittings at Antibes close to Nice, he is a specialist of original creations in sailmaking : He has made for instance an aero sail system for a long distance swimmer, before setting about WINDYAK rig and its unique furling device using a pulling up sleeve.